CREST BACKYARD HOMES ARE ON A ROLL! Backyard homes (casitas, granny flats, accessory dwelling units) are literally rolling into many communities throughout California to save the day! CREST HOMES/ON THE LEVEL is one of the early pioneers using manufactured housing as an innovative solution for a backyard home. 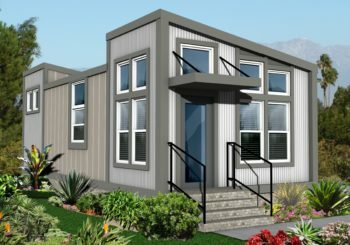 Backyard Home: The LEUCADIA CASITA 12×36 (432sf), 1 bedroom, 1 bath will be delivered in early May, 2018. 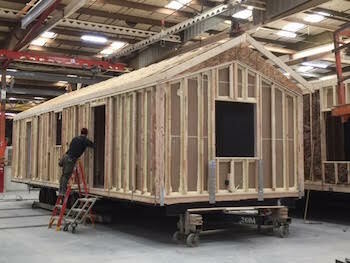 The pictured backyard home is the first ADU to roll off the CREST BACKYARD HOME assembly line at the Silvercrest facility in Corona. It will be transported to Leucadia, a North San Diego, CA beach town, where it will be installed in a small manufactured home community. Yet, this could just as easily be going in your own backyard. Our backyard homes can be assembled, delivered and installed within a few months. And the good news is, Encinitas and its four Burrough—Leucadia, Cardiff, Cardiff-By-The-Sea and Olivenhain, are adopting a streamlined permit process. This can save as much as $3,000 in fees. Encinitas is also leading the field for pre-approving plans and models that meet their criteria which further fast track the process. FLOOR PLAN: BACKYARD HOME: The LEUCADIA CASITA, 12×36 (432sf) 1 bedroom, 1 bath. The biggest challenge for most backyard home buyers is having the price point meet their budget, design expectation and timeline. The good news is that a CREST BACKYARD HOME can generally be manufactured, delivered and installed while concurrently moving through the permit process. And better utilization of time always means reduced costs. This 12 x 36 (432 sf) one bedroom, one bath Crest Backyard Home will end up costing less than $100,000 including permits, site preparation and installation upon completion. Overall cost depends on buyer appetite. The more bells and whistles, the higher the cost. Additionally, the permitting, site preparation, infrastructure and ancillary items i.e. hardscape, landscape, driveway, patios, etc will impact the overall cost of the project as well. California is taking strident steps to deal with the affordable housing crisis. And San Diego is one of the leaders in the field. Another plus is that many of the San Diego building jurisdictions are simplifying the process and reducing costs, enhancing the desirability. So with all the stars aligning and the economic and timeline advantages of manufactured ADU’s, this should be the right choice for your backyard.